OtterBox has released the OtterBox Commuter Series for HTC EVO 4G and the Commuter Series case for the DROID Incredible by HTC. The OtterBox Commuter Series provides two innovative layers of protection including a silicone mid-layer wrapped in a polycarbonate shell to prevent damage from bumps and shock. Silicone protects the power and volume buttons and silicone plugs flip open for access to the charger/accessory, headset and HDMI jacks. The cameras, speaker, kickstand and proximity sensor also remain accessible through the case. 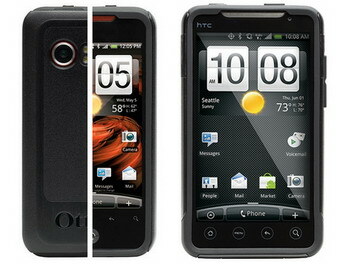 The OtterBox Commuter Series for HTC DROID Incredible offers guaranteed protection from scratches, dings, bumps and dust. Three slender, yet sturdy layers offer tough protection in a sleek package. With a slim form factor and smooth outer layer, this case slides easily in and out of a pocket, purse or bag. The OtterBox Commuter Series For HTC EVO is a quality case that will surely protect your new phone from scratches, dings, dust and bumps while allowing for full usability of the EVO's functions. Three slender, yet sturdy layers offer tough protection in a sleek package. With a slim form factor and smooth outer layer, this case slides easily in and out of a pocket, purse or bag. 0 comments on "OtterBox released Commuter Series cases for HTC DROID Incredible and HTC EVO 4G"